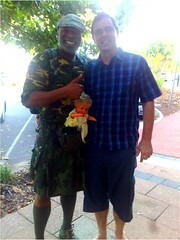 Pauli, a tall dark strange englishman in a military kilt, helped us celebrate Australia Day today. We met this joyous riot of a man while we were having a few Coronas and a light meal at Scarborough. In a few weeks, we might forget what we ate, but we won’t ever forget our serendipitous meeting Paul and the laughter he shared with us. Thanks for the fun, Paul. You make the world a better place.